New book, 264 pages. The Consulting Veterinary Nurse is an invaluable source of information for all veterinary nurses setting up and conducting their own nursing clinics in small animal practice. 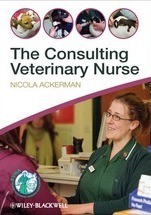 From the basics of setting up the consulting room to running and marketing individual clinics, this book provides a comprehensive coverage of the role of the consulting veterinary nurse. A large section of the book details specific clinics run by nurses, including nutritional assessments, behavioural clinics, puppy parties, seasonal information campaigns, senior pet clinics and medical clinics for a full range of conditions from arthritis and dental problems to epilepsy and cancer. A chapter specifically on rabbit clinics is also included. Written by an experienced senior veterinary nurse, this is a vital guide for all veterinary nurses seeking to develop their consulting role and contribute effectively to the long-term success of their practice. KEY FEATURES Provides a comprehensive guide to the role of the consulting veterinary nurse Details specific nutritional, medical and behavioural clinics run by nurses Includes advice on presentation, marketing and communicating with clients Discusses client compliance and internal procedure and protocol Contains sample diet history sheets and unit conversion charts for use in practice Endorsed by the British Veterinary Nursing Association.